One of the easiest ways to preserve most of your summer produce is by freezing it. Be ready to freeze as close to harvesting as possible, though produce may be kept in the refrigerator until you’re able to freeze it. Many containers can be used for freezing, including glass jars, plastic/glass containers with tight-fitting lids, plastic freezer bags, heavy-duty aluminum foil and freezer paper. Some fruits need to be frozen with sugar or a sugar syrup to improve their color, texture and flavor. Many vegetables benefit from being blanched, or briefly heated with boiling water or steam, to slow or stop enzyme action within the vegetable. Frozen produce can be stored for 8-12 months. Drying removes the moisture from your fruits and vegetables, preventing mold, bacteria and fungi from growing, as well as slowing the natural food enzymes. The foods will become smaller and lighter, then are typically re-hydrated when used in cooking. While a dehydrator may be your first thought of how to dry your produce, you can also dry them in an oven or in the sun. Most dried fruits can last up to a year in a cool, dark place, while veggies only last about 6 months. Many Wisconsin fruits and vegetables can be stored, if you have or can create the right conditions. Generally, your produce needs one of 3 storage environments: Cool and Dry (50-60° F & 60% humidity), Cold and Dry (32-40° F & 65% humidity) and, most often needed but the hardest to achieve, Cold and Moist (32-40° F & 95% humidity). Storage time varies greatly between fruit and vegetable varieties, from one week to 10 months. By canning, you’ll be preserving your produce by removing oxygen, destroying enzymes within, preventing growth of other organisms and forming a vacuum to keep food in and air out. 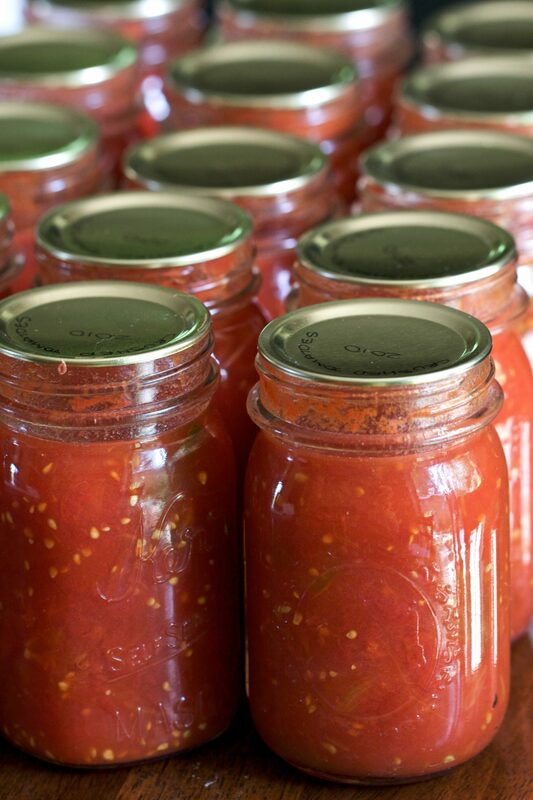 Canning is best done in glass jars (free of cracks or chips) with 2-piece, vacuum seal metal lids. You should can within 6-12 hours of harvesting for the best results. Low-acid foods need to be canned in a pressure canner, while higher acid foods can be canned in boiling water. Store in a cool, dark place, in temps of 50-70° F for a year for best results. Other methods to consider include pickling, curing, smoking and fermenting. Before trying any of these methods, be sure to research the fruit or vegetable and the proper preservation technique to ensure that you are preparing and preserving your food in the best way possible. Stay tuned next week for a freezable sauce recipe you can prep to use up all your fresh tomatoes this year!